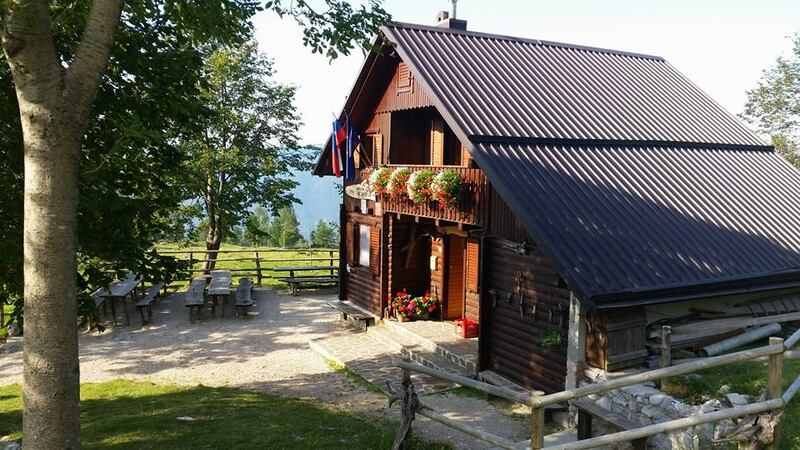 We drive to Kobarid or Kamno pri Tolminu and continue driving towards village Vrsno. 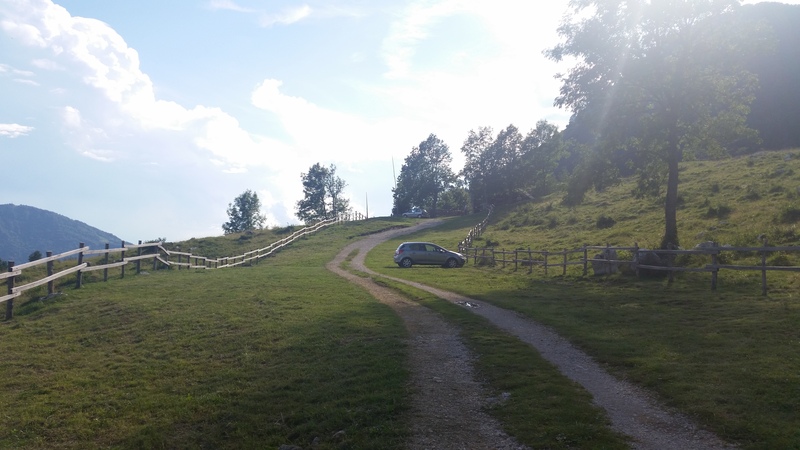 We continue driving from Vrsno towards Village Krni and then towards Kuhinja mountain pasture. We park on a parking lot couple of minutes before a cottage on Kuhinja mountain pasture. In the parking lot from which prohibited further driving is focusing on the left below the road to us in less than five minutes leads to the mountain cabin in the Kitchen. In the cottage is focusing right up slightly in the direction of Krna. The way forward is initially zložno then occasionally more sharply vzpne Monday grassy slopes, and rapids of the pasture fences. The path that crosses a few poor mountain road us after about 40 minutes walk leads to an old military villages on the mountain Loon. The way forward has a few crosses in the street, then we join the path of the end of the road (Mountain Zaslap). The path then in a moderate upswing Monday crosses grassy slopes slightly right, then turn left to the unmarked crossroads on the way forward called Leger. Continued right up through the lower a marked path which initially alongside the more eastern route climbs from the Krn. Slightly higher as broad a much overgrown path in a moderate rise of crosses against the east slopes Krna. Nice viewing path then leads us on Krnsko škrbino. Ten minutes following the steep ascent to the slopes Monday Stone Krnskih stubs, which encountered the remains of World War II. Here we continue on the right path, which becomes technically difficult. 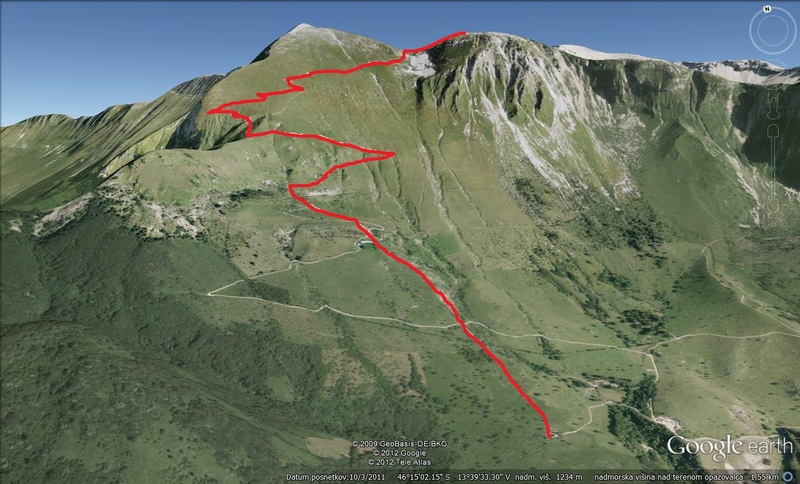 Monday exposed to us the way, with the assistance of the stairs leading Monday prepadne southern slopes Batognica. Wet snow or high risk of slipping. A few meters below the summit, however, lodged in the way and easily reach the top.